You get 2 ink bottles in the kit to print up to 8000 pages. The ink is pigmented, and it means colourful prints will dry out in an instant and won't smear. If you're looking for a highly efficient yet economical multifunctional printer, you'll hardly find a better model than Epson M200. Brother BRAdmin Professional Software will help you control and adjust printing settings easily. First copy out time is a bit more than 10 seconds. USB cable of more than 2m might slow down data transfer between your PC and the printer. This all-in-one printer will become an irreplaceable assistant in your office. 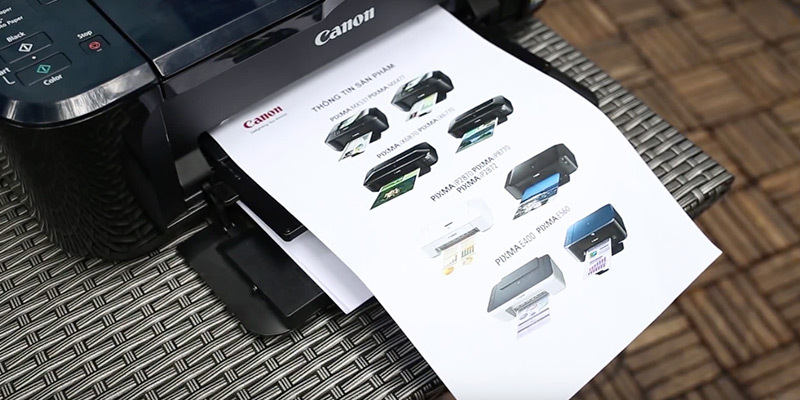 From now on, you'll be able to print, copy, and scan from several devices in one go. 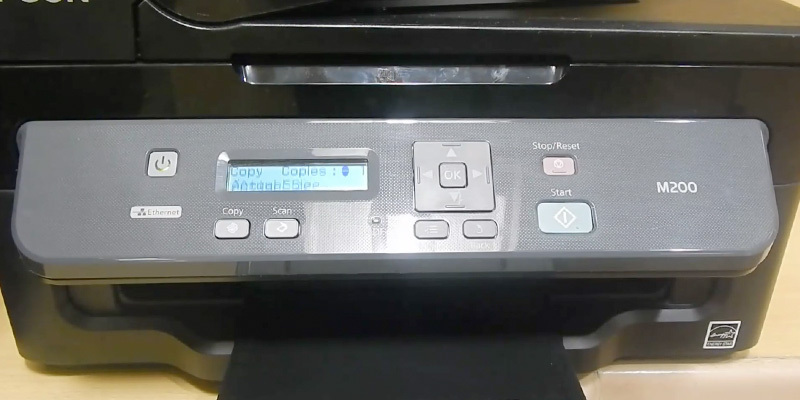 Auto Power On function rids you of the necessity to switch the printer on every time you want to use it - the device starts its operation once a print command is given. Scanning over Wi-Fi might be problematic sometimes. Reasonable price-quality ratio makes Canon E560 a perfect choice for those who want to get sharp and low-cost printouts within minutes. Monthly printing capacity is 10000 pages. The grating at the front of the printer prevents it from overheating. 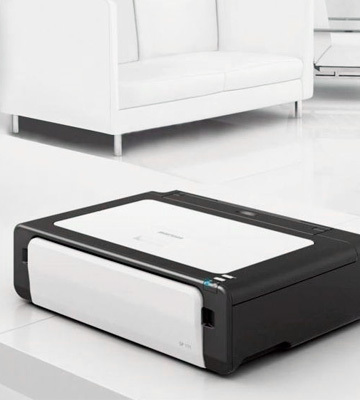 Energy efficient and silent, Ricoh SP 111SU will help you handle both home and office printing tasks with the maximum convenience. 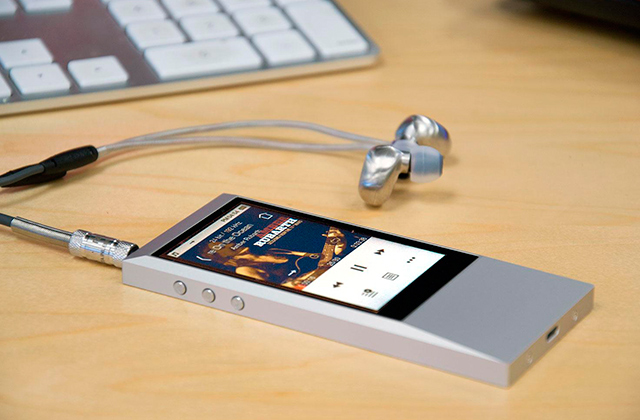 Easy set-up and user-friendly interface enable you to use the device right out of the box. Printing speed leaves something to be desired. Wallet-friendly yet functional, this printer performs its functions on par with more expensive models represented on the market. Quality and performance are probably two of the main features every buyer is seeking when choosing a printer, and Epson M200 meets both requirements. The high quality of printed materials is achieved with Epson Micro Piezo technology. The advantage of this technology is reliability and durability of the printhead that produces ink drops of equal size to ensure sharp images. 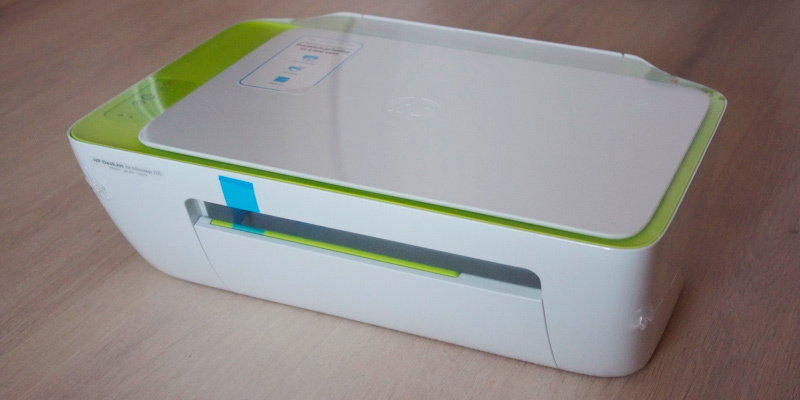 The ink used in this all-in-one printer is pigmented, and it means it dries out in seconds and doesn't smear. One more feature that ensures high-quality printouts, to be more precise, makes them detailed, is the maximum printing resolution of 1440 dpi x 720 dpi. Not only printed pictures are sharp, though - 1200 dpi x 2400 dpi scanning resolution gives you a chance to store scanned documents and pictures of great quality on your PC or laptop. The device can print up to 34 pages per minute and with printing speed this high, your working process will become much faster. 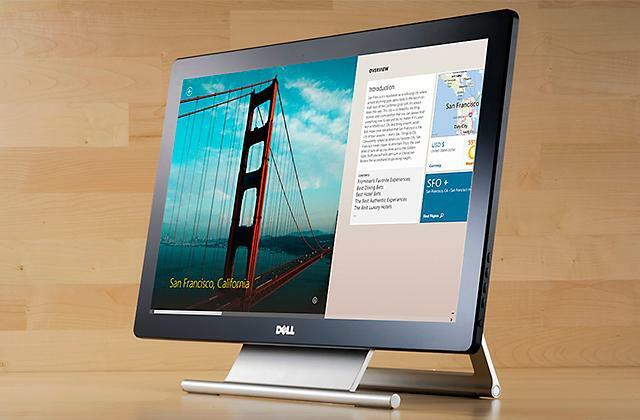 What differs this all-in-one device from the majority of its counterparts is low printing cost. It has become possible due to the ink tank system that is much more economical in comparison to cartridges or laser toners. Moreover, you get 2 ink bottles with the printer. Their volume of 140 ml and 70 ml is enough to print up to 8000 pages, so you can forget about ink tank refilling in the nearest future. However, when it's time to carry out the procedure, you won't face any troubles refilling the ink tank on your own. And if you need to move the printer from one place to another, you can be sure the ink won't leak since ink bottles are secured inside the tank. 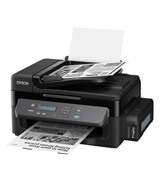 Mobile printing adds greatly to the usability of a printer, and Epson M200 possess this handy function. Compatible with Epson iPrint application, the device allows you to print PDF documents from Android gadgets and PDF, Word, Excel, and PowerPoint files from iOS ones. Moreover, this application helps you save scanned images directly to your smartphone or tablet. Automatic Document Feeder (ADF) is worth mentioning as this very function saves you the trouble of flipping paper sheets manually. Just insert 30 sheets into the ADF tray, and let copying and scanning processes be the easiest thing ever. If you’re looking for an all-in-one device to handle many printing tasks at work, you’ll hardly find a better model than the Brother DCP-1616NW. Being a monochrome laser printer, it uses laser toner that suffices to print two or three times more sheets than an inkjet device. Thus, the toner of this model can print up to 1500 sheets before you run out of toner. One more advantage of laser toners is that they’re filled with toner powder that will not dry out even if you don’t use the printer for extended periods of time. In general, they are usable during three years. Finally, we’d like to point out the maximum printing (2400x600 dpi) and scanning (1200x600 dpi) resolution that provides great quality of any document you print, copy, or scan. Wherever you use your all-in-one printer, at home or in the office, we dare assume you want its control to be as convenient as possible, and the Brother DCP-1616NW is great in this regard. Take notice of the control panel – buttons are marked so you know for sure which command you give to the printer, and 2-line LCD display shows all necessary information. You can gain even more control over printer operation with the help of BRAdmin Professional Software. Developed by the manufacturer, it enables you to look through and change printing settings, create groups of printers, view device information and usage history, get error notifications, control local devices, etc. 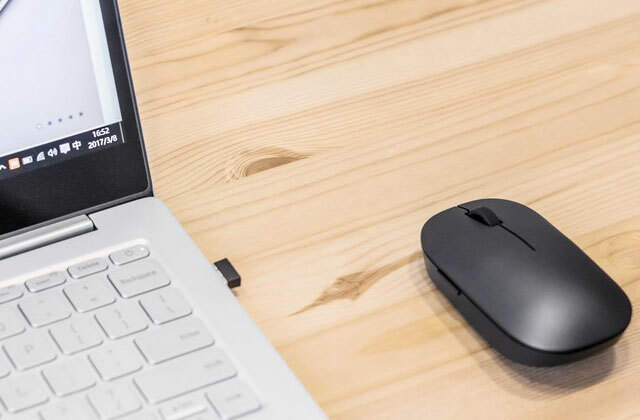 With this software, you’ll also be able to monitor other network-connected printing devices. 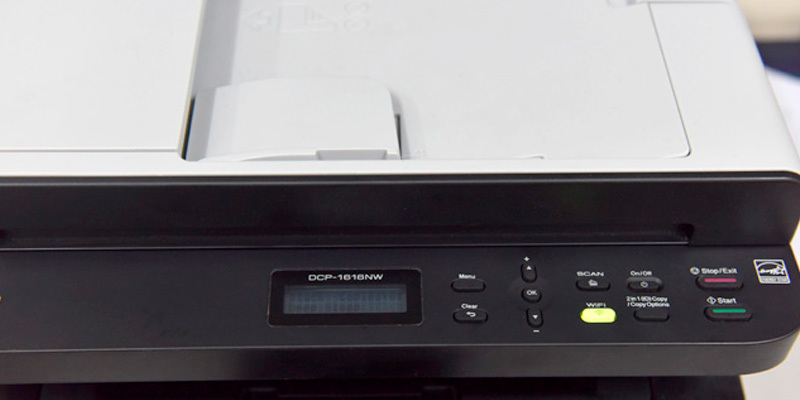 The Brother DCP-1616NW can be called a universal printer in terms of connectivity options. 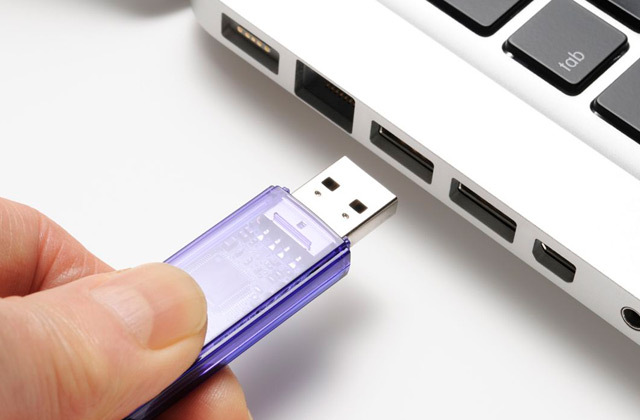 The device can be connected to your PC or laptop with a USB 2.0 or Ethernet cable. 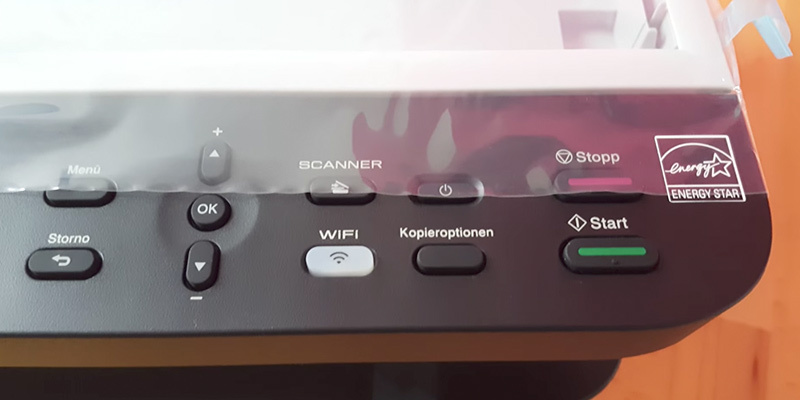 This very feature gives you a chance to connect the printer to several devices simultaneously. 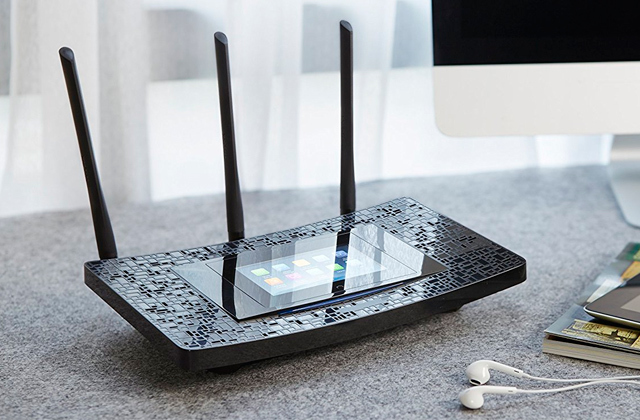 Besides corded connection, it also features Wi-Fi one so you can print files from your mobile gadgets. If you have to print a lot of pages in one go, tray capacity of this device deserves your attention. The input tray can hold up to 150 sheets while output one suffices for 50 sheets. With a capacity this large, you won’t need to watch the whole printing process. Just load the paper, give print command, and have a cup of tea while the Brother DCP-1616NW gets the work done. By choosing the Canon E560, you’ll get a great device that prints, copies, and scans both monochrome and colourful documents. 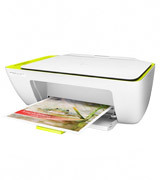 The printer features 4800x1200 dpi resolution that makes it a worthy rival to more expensive appliances. 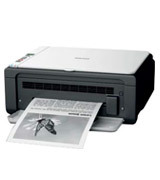 Canon E560 is an inkjet model and it means it will handle documents as well as photo printing perfectly fine. With this device at hand, you’ll be able to print even large photos (up to A4 size) in no time, and a borderless print option will definitely come in handy for photo printing. By the way, this all-in-one printer is sold together with black and colourful cartridges that suffice to print 800 black or 300 colourful sheets. The size of the device is worth mentioning, too. Measuring 449 x 304 x 152 mm, the printer will find its place on your desk or any other suitable flat surface. Taking into account the pace of modern life, the manufacturer of the Canon PIXMA E560 has equipped the device with Wi-Fi option, thus making it even more functional. 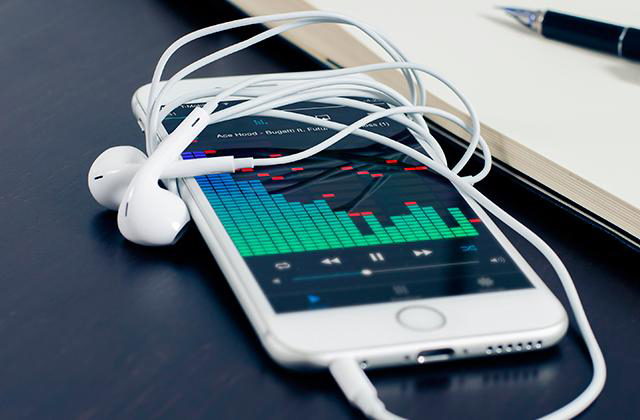 To put it simply, the combination of Wi-Fi connectivity and special application you'll install on your Android or iOS gadget will offer you an opportunity to print documents and photos from your devices as well as store copied and scanned materials there. 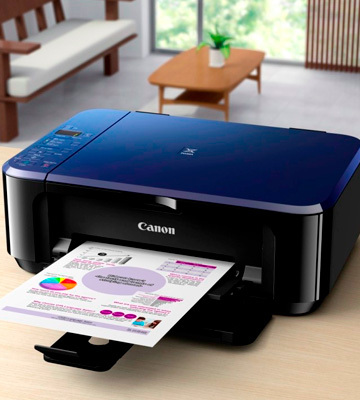 An outstanding feature of the Canon E560 is its Power On mode that rids you of the necessity to turn the printer on manually every time you need to print, copy, or scan something. Just switch the device once and every time it gets a command from your PC, it will start working automatically. With the user in mind, the manufacturer has done its best to make the use of the Canon E560 both convenient and economical, and automatic duplex printing option is a case in point. This very function saves you the trouble of controlling printing process on your own as well as reduces paper expenditure. For those seeking functionality, high printing quality, usability, and affordability in printing devices, the Ricoh SP 111SU will become the best choice. Although this model is a monochrome all-in-one printer, it still can impress you with other specifications. Being a laser model, the printer boasts great toner capacity that allows you to print considerable volume of materials without the need of frequent toner change. As for printing quality, it also won’t leave you indifferent – 1200x600 dpi for printing and 600x600 dpi for copying and scanning are enough to meet the requirements of both home and office use. Don’t overlook the printing speed of 16 pages per minute that is one more example of the printer’s great performance. Moreover, you’ll get the first printout 13 seconds after the device is warmed up. 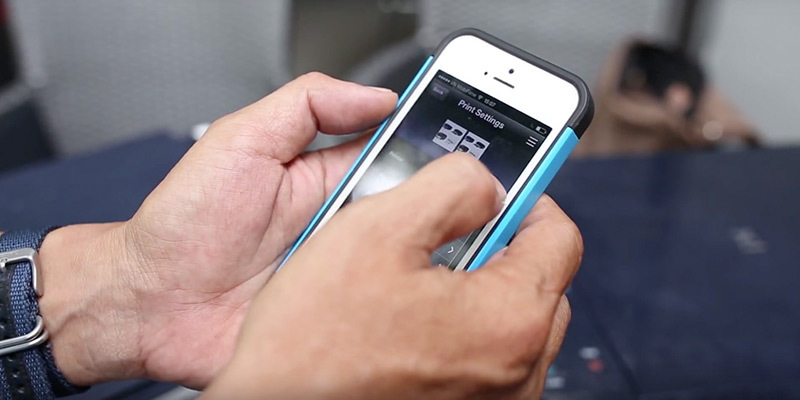 Useful tips wouldn’t go amiss when it comes to handling a multifunctional device. 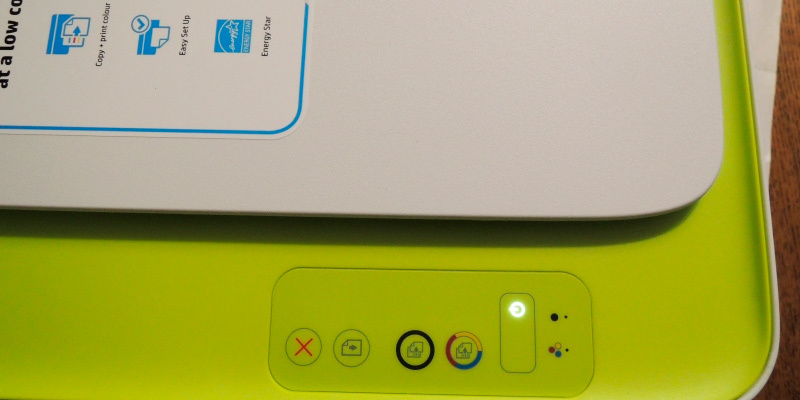 That’s why the control panel of the Ricoh SP 111SU is equipped not only with the buttons for choosing the necessary functions but also with several indicators. Thanks to these indicators, you’ll always know when it’s time to add paper into a tray or substitute the toner. Why, they even show you error notifications so that you always understand whether the printer works properly. 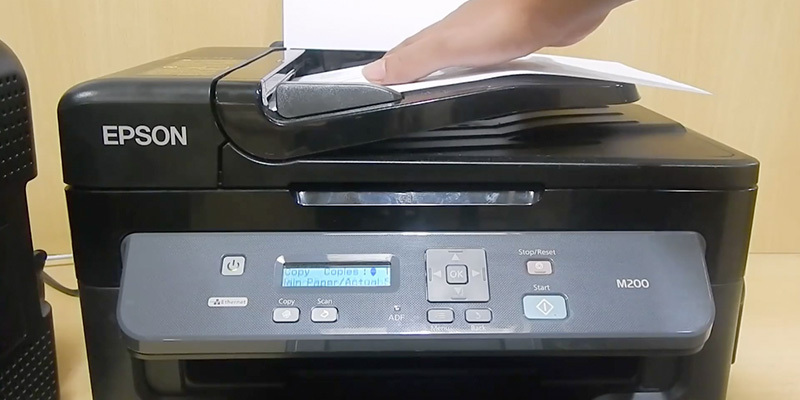 Silent work is a great advantage of any home appliance, and a printer isn’t an exception. 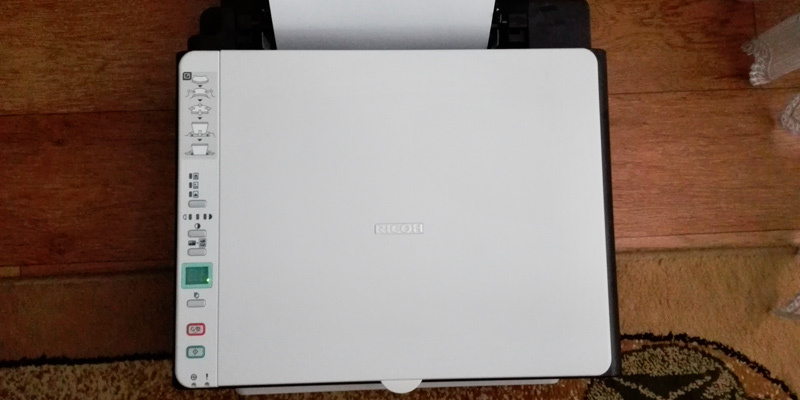 The quiet operation of the Ricoh SP 111SU is possible due to the lack of a fan inside the device. Yet, it doesn’t overheat thanks to the grating that serves as an air vent. 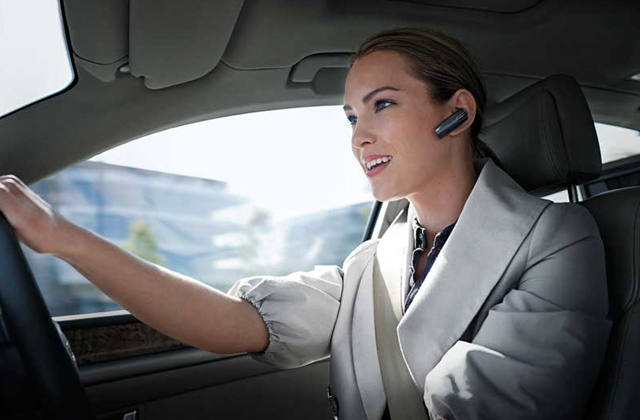 Choose the all-in-one printer from Ricoh to enjoy quiet and great performance at the same time. Not all printers can boast monthly performance of several thousand sheets, but it’s not the case with this model. The fact is it can deliver up to 10000 sheets a month if need be. However, it’s recommended not to misuse this possibility as it can affect the service life of the device. If you follow the manufacturer’s advice to print 600-800 pages per month, you can be sure the Ricoh SP 111SU will last you a lifetime. 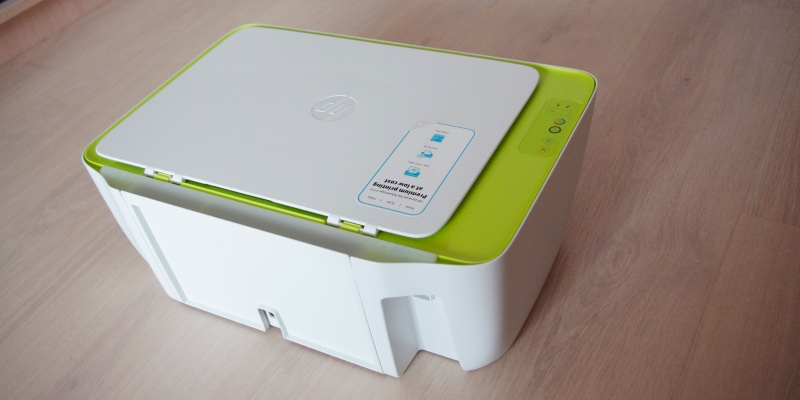 At the first sight, the HP DeskJet 2135 might seem to be one of the hundreds of similar all-in-one printers represented on the modern market. 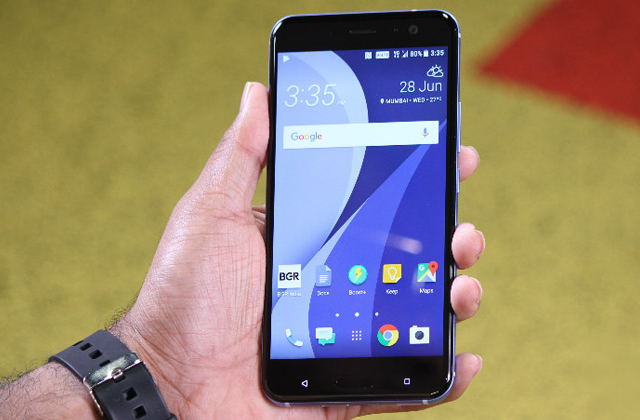 But when you take a closer look at this device, you’ll notice some features that distinguish it from its rivals. 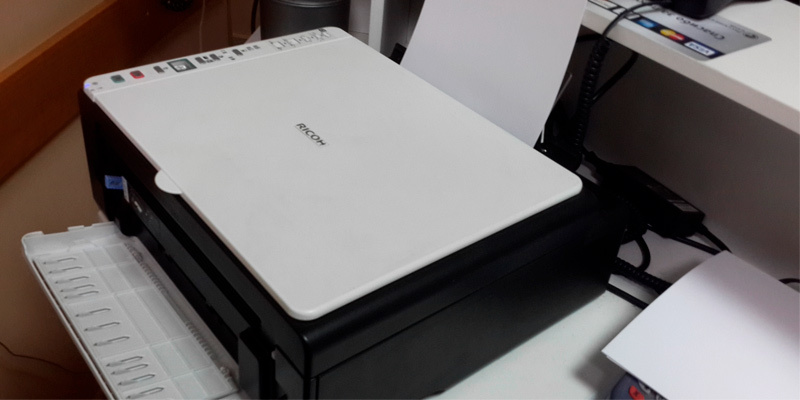 First of all, this model is colourful, which makes it suitable not only for document printing, copying, and scanning but also for photo printing. Secondly, the device boasts high printing and scanning resolution that is unrivalled by its more expensive counterparts, thus, ensures high quality of any material you process. 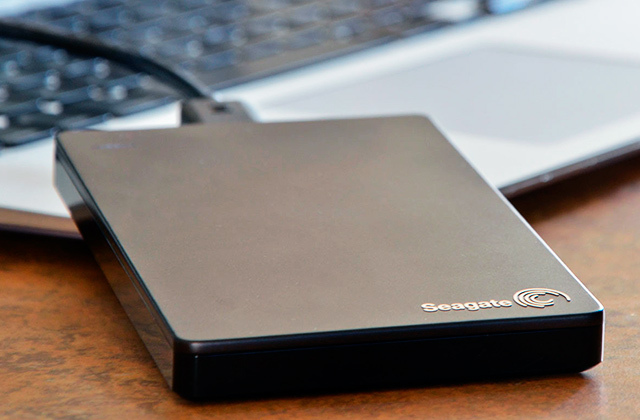 On top of that, the device can scan the majority of file formats including JPEG, PDF, PNG, etc. The only thing we want to point out is that printing speed is not as fast as you might expect. 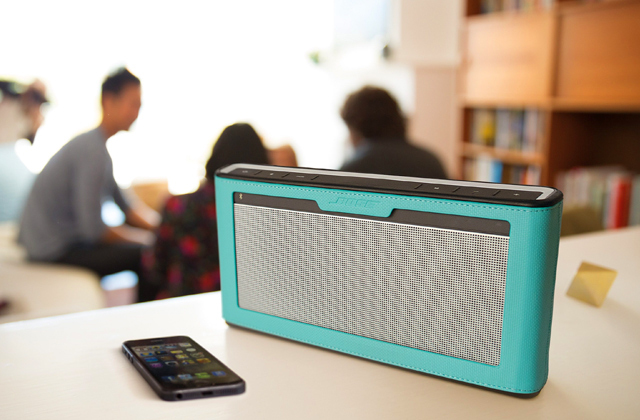 The device delivers 7.5 black or 5.5 colourful pages per minute. Still, taking into account all the described features, one can claim the HP DeskJet 2135 a worthy purchase. 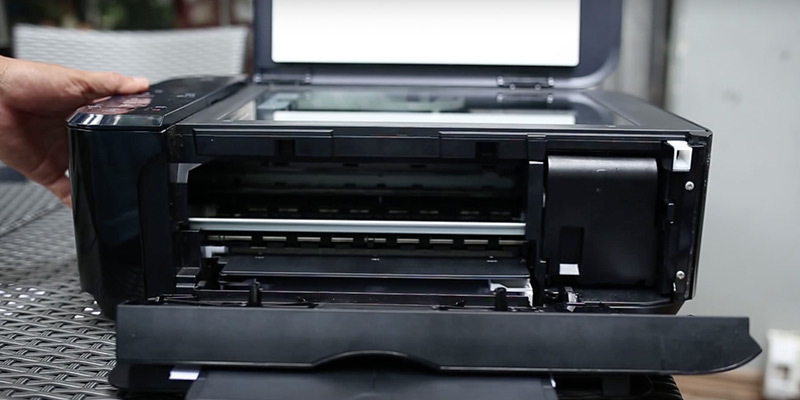 Although the size of an all-in-one printer might not seem an important issue, it can become the main concern when you don’t have much space in a room. The HP DeskJet 2135 model is 425 x 304 x 149 mm, and it means you’ll be able to place it almost anywhere you need, be it a desk or a shelf. The only thing we’d like you to keep in mind is that with input and output trays extended, the device gets slightly bigger. 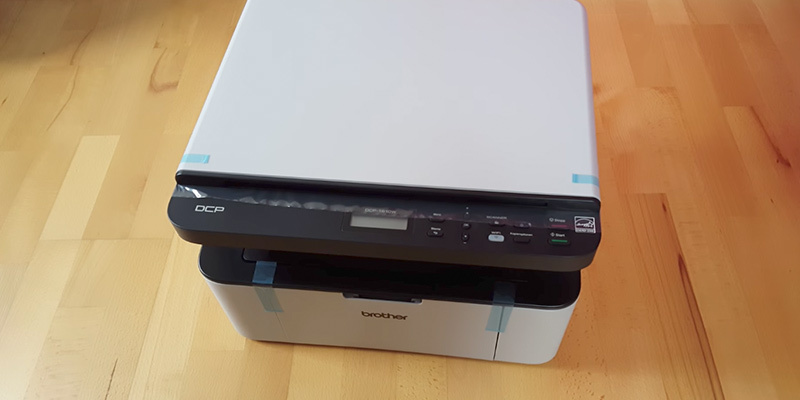 As it was mentioned above, this all-in-one printer is colourful, consequently, it is sold together with two (black and tri-color) cartridges. With this kit, you’ll be able to print up to 260 black or 100 colourful pages before you run out of ink. 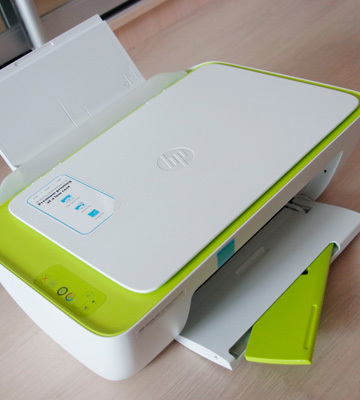 To make the use of the HP DeskJet 2135 convenient, the manufacturer has included all necessary accessories in the box. The package contains the printer itself, two cartridges, power and USB cords, software CD, and setup poster. A kit this full enables you to start using the printer as soon as you unpack it. 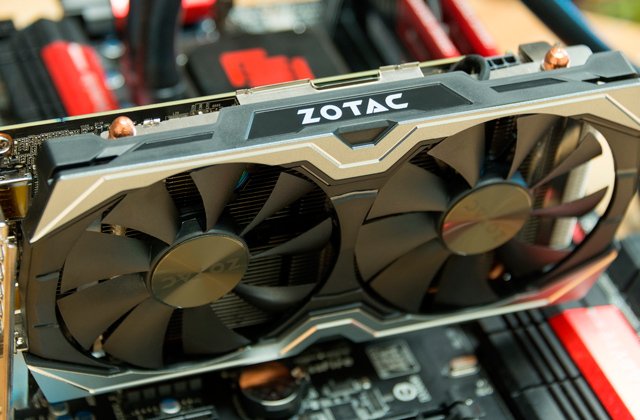 Moreover, the installation process and settings adjustment don’t require any special skills and don’t take much time. Just follow the steps you’ll find on the setup poster and there you are – the HP all-in-one printer is ready to handle any task you need. All-in-one printer is a multifunctional, high-quality device, made for growing businesses and small workplaces and for everybody who wants to complete the printing tasks quickly and do his own business. 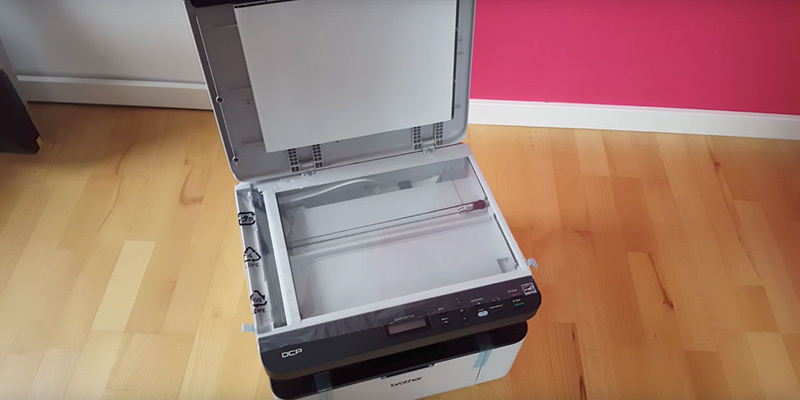 This device is a printer, scanner, fax, and copier. Thanks to the huge opportunities of possessing digital documents and digitising printed sources, this device is an essential assistant for your home and office. He takes less space than other devices and you shouldn't buy consumables for each of them. 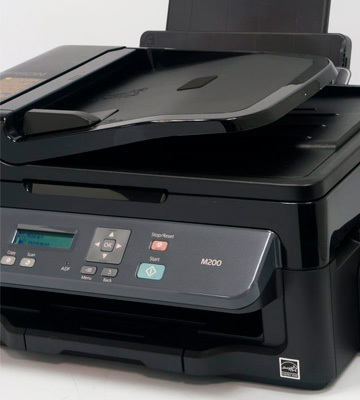 All-in-one printer has the most important functions for efficient working with paper and electronic documents, wireless connection and mobile printing. If you don't use fax or scanner and are interested in printing documents, we recommend you to pay attention to one of the models of home printers. The first important feature that we need to point out is the performance. It covers both the print method and the print speed of the device. Accordingly, all-in-one printers can be divided into ink-jet and laser models. 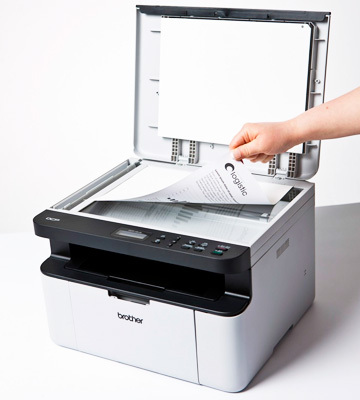 For those who plan to print a small number of documents, it is worth considering ink-jet models which are known for their average productivity and relatively low cost (including consumables). 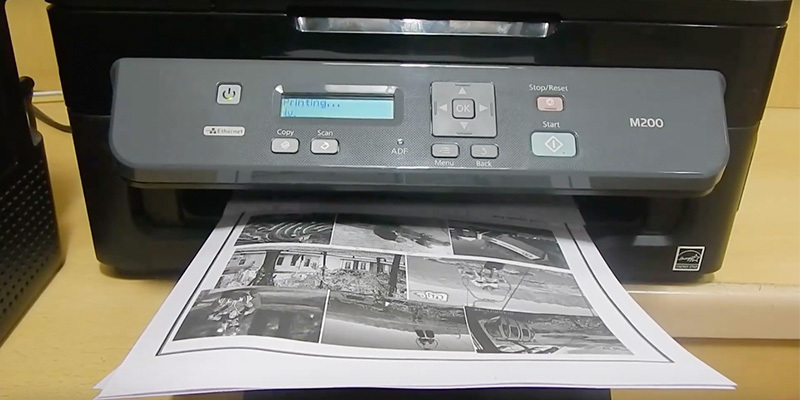 On using these printers, you'll get high-quality print images and vivid documents without spending a great deal of money. Those who plan to use a printer for business purposes should consider laser models since they can cope with large batches with no effort at all and are easy-to-maintain. Also, you need to keep in mind that printing speed is what determines the overall performance of the unit. The common average print speed gets up to 20 pages per minute (ppm), however, there are high-performing models where the speed may get up to 30 ppm. Consider the print/scan resolution as well since these are the parameters that specify the unit performance in more details; the higher this number is, the better the scan/print quality will be. The second most important feature you need to pay attention to is the material that printer can handle. It is important to learn what paper sizes can be processed; the supported sizes clearly illustrate the chosen printer's versatility. Present-day models work with a standard A4 paper size as well as can print on the A5, A6-sized paper, and envelopes of different sizes. Printers with such functions can be used for making colourful greeting cards on any occasions and events. All-in-one printers do an excellent job at photo printing, today they can even print out on CDs/DVDs. Since many of these models are acquired for office use, it is worth noting the capacity of a paper tray. Most models come with trays that can accommodate 250 sheets, which is an average figure, but there are models with several trays. 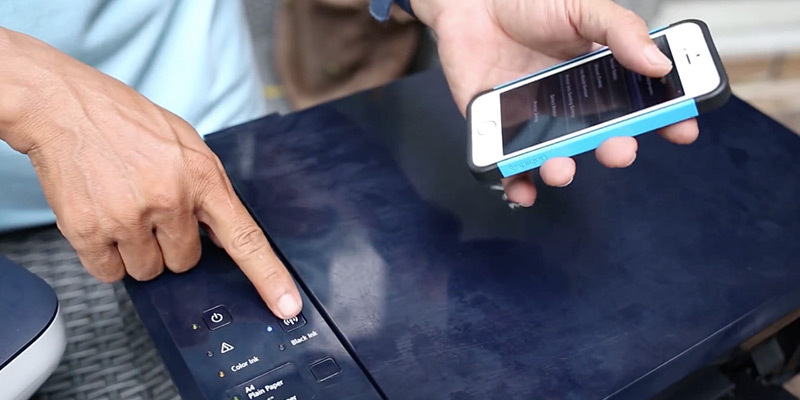 And the last but not the least feature to consider is the convenience of a printer. It is better to choose a model with a wide display where you can view all current information and the operating mode. Having picked a model that can perform duplex print, you will get a device that can perform two-sided printing with no manual effort. 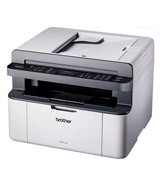 There are also models which use a duplex feature for printing, sending faxes, scanning documents, and even copying. It is necessary to consider a model with an ADF (Automatic Document Feeder) but, as a rule, all present-day all-in-one printers have got one. Q: What is the largest paper size an all-in-one device can print? 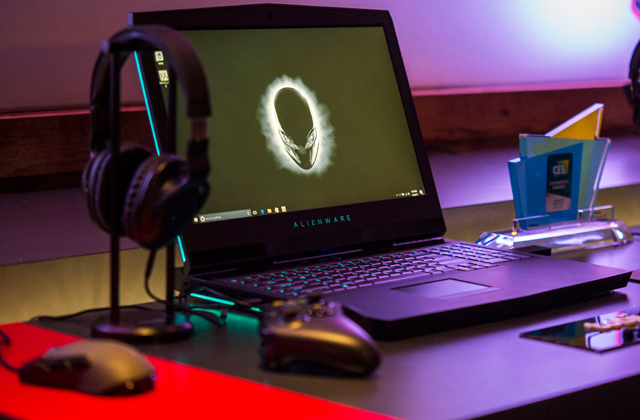 A: Every device has its own specifications. To know for sure what paper sizes (and types) your printer can handle, check this information on the official site - as a rule, the manufacturers always include it in the product description. Q: If I don’t use my printer for half a month, what will happen to ink? A: It depends on the type of your device. Speaking of inkjet printers, ink cartridges used there tend to dry out in the course of time. Of course, they won’t spoil in a week or a fortnight but it’s still recommended to print at least several pages from time to time to prevent this unpleasant occurrence. As for the laser models, they print with laser toner, a powder that doesn’t deteriorate during long periods (several months or even a year) of inactivity. Q: Can I refill ink cartridges or change laser toners on my own? A: In general, these processes don’t require a user to possess special skills. Consulting a manual or watching an online video tutorial can help you refill cartridges or change a toner effortlessly. However, these actions can void the warranty so it’s important to check warranty terms before doing anything on your own. If you’re not sure you’ll manage cartridge refilling/toner replacement neatly, it’s better to address official service centre for assistance. Q: How do I maintain my all-in-one printer? A: All-in-one devices need outer and inner maintenance. 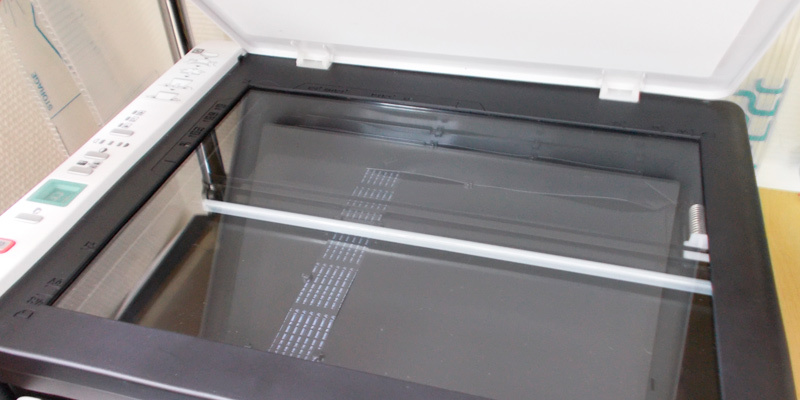 By outer maintenance, we mean the necessity to clean the printer’s body and scanner glass from dust and fingerprints with a soft damp lint-free cloth. Inner maintenance includes cleaning print cartridges, toner drums, paper rollers, etc. You can manage the former procedure on your own, but it’s better to ask professionals for help with the latter one. Q: What is usually included in the box? 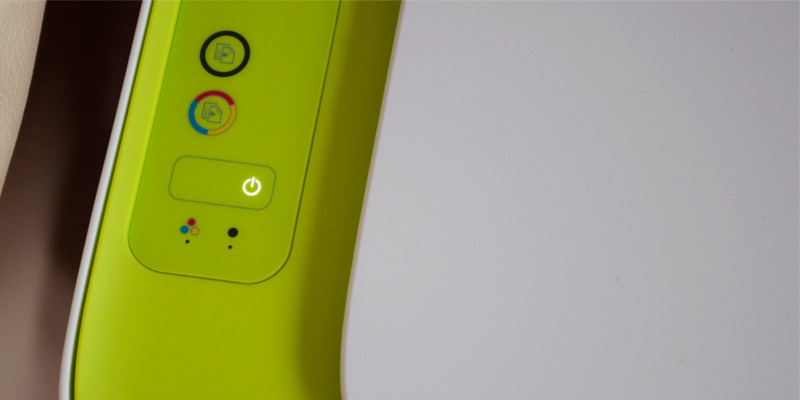 A: The manufacturers usually include everything you need to start using the device right out of the box. Thus, you get an all-in-one printer, cartridges/toner, a power cord, connection cables, and a manual in the package. However, note that paper isn’t in a kit, so you have to but it separately. Q: I plan to print a lot of photos. What all-in-one printer should I choose? 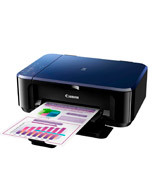 A: If printing photos is at the top of your list, you definitely want to choose an inkjet all-in-one device. These printers are considered to be the best when it comes to photo printing. Plus, they are cheaper than laser ones, which is always a benefit. 1. 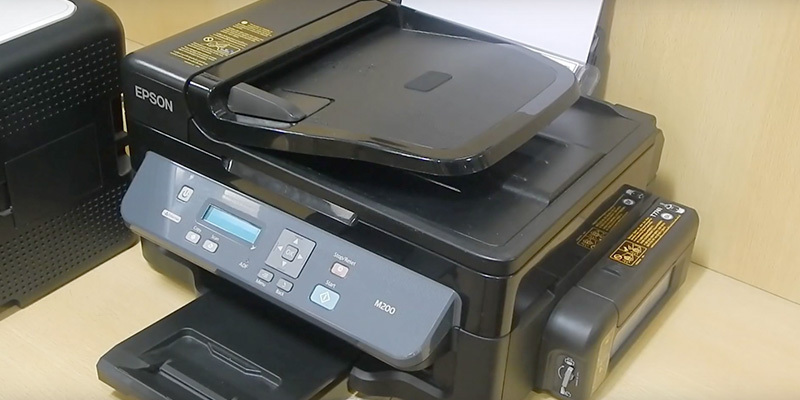 All-in-One Printer Buying Guide, eBay. March 3, 2016. 3. Printer Buying Guide, BestBuy. 4. Ted Needleman Home Printer Buying Guide, Digital Trends. May 19, 2014. 5. Steve Duncombe Which printer do you need? Choice. August 22, 2016. 6. William Harrel A Guide to Multifunction Printers, About. January 08, 2016. 7. David Stone, Tony Hoffman How to Buy a Multifunction Printer (MFP), PCMag. June 19, 2014. 8. Ari Altman The Printer Buyer's Guide, The Tech Buyer’s Guru. May 10, 2016.